This card, made available by Derek Walley, was posted in Feb 1906, so the photo was probably taken about 1901. It is given the title 'Hampton Road, Worthen' but locally, and in my other uploads, this road is known as Back Lane. It may have been referred to as Hampton because this lane eventually leads to either the farming hamlet of Hampton Hayes in the north, or Hampton Beach to the north-west. Information suggests the identities of 3 people in the photo. The unhatted lady to the left is Alice Blakemore [bap Jan 1882]; she lived at Corner House, off camera, with her parents. The man behind her is Alfred Speake [bap Jan 1866], who was a grocer's assistant and who lived with his mother Eliza and sister Rosa at Church Farm, near the entrance to Worthen. 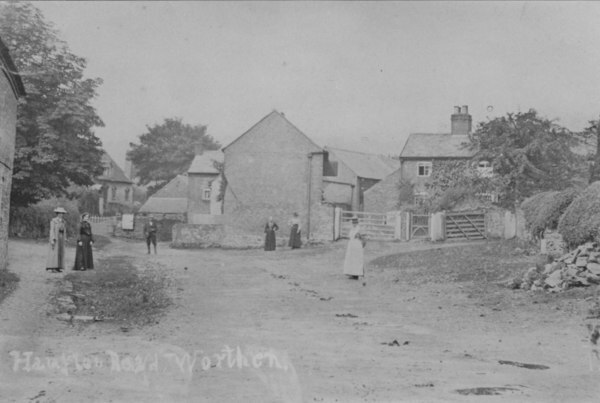 The lady to the right in the white apron is Emma Lloyd who lived with her husband Tom, a bricklayer, on the main street of Worthen. And the dog in the front right was called Tabby. The house on the far right was lived in then by Edmund Thomas, a builder, together with his cousin Agnes Lewis and a servant Mary Bunting. By 1911 a medical practitioner was living there and this was a house often lived in by doctors in the first half of the 20thC. The farm on the far left was then run by Thomas Dyas; his widowed sister, Mary Owen, also lived there.